1) Another great win by this team, thoroughly dismantling the Skins. The score is not even doing it justice. But no complaints, a nice quality win. 2) There were so many reasons to lose this game for the Giants. All the distractions, no Burress, Pierce caught up in the criminal activity (Burress will be charged with felony possession tomorrow). No Robbins. No Bradshaw. Redskins emotional pregame honors for Sean Taylor. Redskins NEED this game. Hixon not 100%. To come ready to play, to be so professional, to play and match that intensity early and finish this game with a solid win, what more is there to say? 3) No Giants team has ever been 11-1. We have been saying all season that this is not your father’s Giants offense- this offense is loaded. And the record is part of that proof. 4) The Redskins said ‘we are going to put 8 men in the box to stop your run game’ and Gilbride/Manning answered by passing successfully. That was the main reason why this Giants offense got it done. 6) COREY WEBSTER stopped Santana Moss. What can you say about Webster? He is a rising star. The refs (browning brown) had a terrible call on him to take away his INT. Joke. 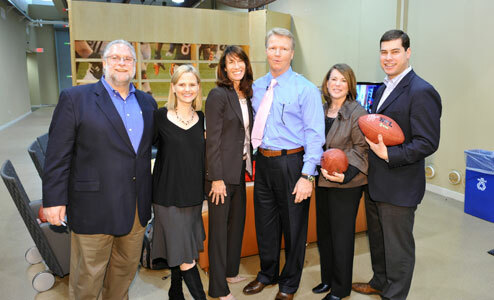 Even Daryl Johnston and Howie Long (addendum: and Bob Costas on the NBC pregame!) criticized the call, which means it was HORRIBLE. Webster had a few more plays defensed, and his play to breakup (and almost intercept) the bubble screen to Moss in Q4 was just awesome. 7) Kevin Gilbride did really well, mixing up the playcalling, not using too many runs when the skins showed so much loaded box. Two slip screens to Ward, that is a great playcall vs the 8 men in the box. After the Ross INT, it is 1st and 10 and everyone on the planet is thinking run from your own 3 yard line, out of a run formation they throw a quick slant to Hixon for 18 yards. FANTASTIC. That is what you see from Walsh, attacking with Montana to Taylor or Rice when everyone is thinking run. We criticize Gilbride for his predictable playcalling, and while he was not perfect today (running plays in H1 not needed at all! ), he was very good and answered with the pass playcalls. 8) Manning said it was a lot of 8-9 men in the box, so he threw the ball well too in order to get it done. 305 yards in the air. Manning remarked that his receivers juked the DBs because of the slick surface, that they had the advantage. There were a lot of dropped balls on both sides, but nonetheless Toomer, Hixon, Ward all had 5 receptions, they got it done. 9) Giants OL gets it done yet again. Nothing on them in the run game, too many bodies to block. And in pass coverage they gave Manning plenty of time to throw. The two sacks were caused by (a) Boss and (b) Manning holding the ball too long.. it will get charged to Seubert but it was not on Seubert. 10) Carney is a machine on FGs, but our kickoff coverage and nets are terrible. 11) Aaron Ross with an important INT. That was a point in the game when the Skins were moving the ball, and even though it was like a long punt to the 3 yard line, it was an important turnover, derailing and demoralizing the Redskins offense. 12) Fundamentally, the Giants made the tackles. No excessive yards after the catch, exception being the one TD play which was a reverse, taking advantage of the overpursuit. Spags/Pierce fingerprints were all over the place, in proper coverages so often. Summary: This Giants team is playing as consistently and at as high a level as I have seen in a long time. The score did not reflect how well the Giants played. The Giants win vs winning teams, at home, on the road, with subs, with distractions. There is nothing that I can see that can derail the offense except not adapting to other teams trying to overload run, and lately the Giants are adapting just fine. Eli Manning did it all on offense and Corey Webster is making a big difference to the team on defense. The silence from his receiver (Santana Moss), yet again deafening. Today is the two year anniversary of the Ultimatenyg NY Giants blog. No cake or candles, but something better… the Giants vs the Redskins today at 1PM. We’ll do some Simms recap later this morning (note, posted behind this post, see below), but first some Burress circus. There is a great deal of speculation swirling around #17. 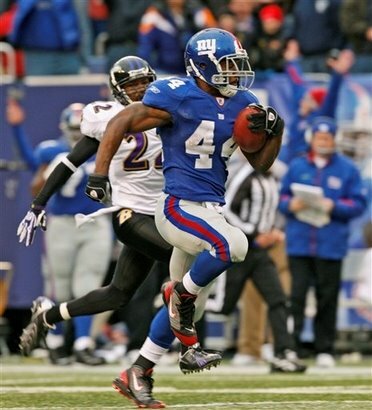 Some believe he has already played his last game as a NY Giant. There are a myriad number of possibilities, ranging from criminal charges, NFL suspension, contract nullification, or something much less. With Goodell attempting to take a firm stance on these types of matters, and with NY Giants team disciplinary history already there, do not expect the Giants to offer Burress protection. They are an organization who not only plays by the rules, they do not like it when others try to skirt them. So I look for the Giants to seek redress at some point on his bonus and look to trade/cut him. As we await more details of the incident, I find it at the very least alarming and at worst damning that his wife would not allow the police into their house for questioning. “We are not in the business of well-adjusted human beings:” Let’s put ourselves in the shoes of the Giants administration. They have dealt with him holding out of minicamp, a training camp slowdown, missed meetings, one game suspension, domestic disturbances, disciplinary benching for first quarter of a game. The Seinfeld yada yada yada. Now guns and gunshots. At some point they have to cut the cord. Time to move on without anymore sideshow distractions than necessary. Would you have someone working for YOU with this track record? The Giants organization has the most patience of ANY TEAM in the entire league. I do not want to hear it for one second from anyone that the Giants were wrong in parting ways if and when they do. The gmen are saints for all I am concerned; they gave this man way many more chances than he deserved BEFORE AND BECAUSE he helped them win a championship. All they have to show for their noble efforts is an employee who continues to disrespect them and himself. Next. Oh, one last thing to all other teams in the NFL- if you think you are going to do something better by bottomfeeding a la Jones for Pacman, think again. There isn’t an organization who could have done it any better than the Giants. Drew Rosenhaus calling Al Davis, come in Al Davis. ADDENDUM 8:30AM- waking up to hear that Pierce was involved. Anyone with any legal expertise please comment on whether his attorney will be able to ‘stave off criminal charges’ for being an accessory. Ugly, all of this. 1) Burress fiasco– It will impact Giants in as much as they will miss Plax, but not past him. Plax won games for them. The team will be strong. It can hurt the team because there was an extra guy who was staying deep instead of worrying about the run. How many times did Plax make the key catch at the key time? MANY times. Separately, the Giants offense better than the Cowboys offense, but they will still miss Burress. 2) QB Matt Stafford from Georgia will likely be the #1 pick in the draft, QB Sam Bradford from Oklahoma will likely be #2. This is good news for the Lions, as they have 3 picks in the top 33, and everyone who is a JR will be jumping for the 2009 draft because they are afraid of the rookie salary clause changing in 2010. 3) Jets – Denver. Both QBs will handle the rain. Jets will not just line up and shut down the Denver passing game. (Raiders pass defense can do that to the Broncos, but the problem with the Raiders was the run defense.) Broncos/Cutler very good passing game, the Jets will not stop them, but they need to get a credible pass rush in order to slow them down. Hard to attack the Jets offense, great running game, formations, movement, the sheer # of plays, Favre is an unbelievable short thrower, all meshing together. Singled out Leon Washington and Dustin Keller. 4) Steelers at NE– The extra days for the Jets, fresher legs helped them vs the Titans, the Steelers have the extra days for this game. Pitt defense can cover WRs, what sets apart the pitt defense is their LBs (Woodley and Harrison). Moss buried the Dolphins last week when they singled him. Moss is still one of the best, he gets it done 1 on 1. NE can play 10 on 9 when Moss is doubled. Do it all game. Casell is now a better runner, he goes straight up the middle because of Moss being doubled. NE cannot cover in the red zone. Cannot pressure the QB consistently. 6) CLE-IND. Cleveland is a mess, they do not get it done in crunch time. Colts without Saturday and Sanders, but Phil still not ready to say that Colts can’t get it done because he has such a low opinion of Cleveland. Not a life-threatening injury. First things first, we all hope the man is okay, which is what it sounds like. A distant second, for the Giants, the Burress circus side show continues. Good stuff from McConkey and Bavaro that will put a smile on your face and remind us that it is all about championships. 1) After 10 years of Reid, he has to be removed. 2) Reid as head coach AND General Manager is not a good combination. 3) Eagles have never had a FB, it kills their short ground game. Reid is the GM, the blame goes back to him for never having one. 4) Yes, Jackson is good, but opposing defenses are going over the top (cover2) now to limit him. He has ONE TD all season, the Giants end-around, so as good an impact as he has made, he is still a rookie and is now reaching a ceiling. Lack of WR is going to be traced back to Reid as GM. 5) Short yardage a killer for the Eagles all season, Bears, Giants, Ravens games only a few examples. The reason why is that their Center and Guard (Jackson and Herremans) are bad, Andrews is terrific but he has been in and out of the lineup due to injury (only 2 starts this season). Andrews can cover up for them when he is in, but only so much. These guys are better in pass protect, but cannot run block to save themselves. Pretty nasty derogatory remarks about Herremans in particular. 6) Reid has lost his mind. When McNabb came into the league, Reid orchestrated McNabb’s introduction very carefully, picking the week after a bye when the opponent was a weak Redskins team. Contrast that with how he now put in Kolb… against a stronger Ravens defense at halftime! Not helping the rookie one bit with that move. 7) Eagles fans unfortunately may have to see McNabb go somewhere else (Vikings?) and then watch as he becomes successful there, the same way Cunningham became successful with Carter and Moss. This is not preferred to see McNabb leave.. keep him for another coach and see how he does. 8) The moves by the Eagles to trade their first round pick down to the second round are very good, but the problem is that the Eagles are still poor evaluators of talent and the draft is not benefitting them nearly enough. And since Reid is the GM too, the blame once again goes right back to him. Add the fact that he is a terrible in-game manager and the worst clock manager, and his time is up. You spend 10 years as a head coach and you do not win a title, time to move on. Some of it is being a veteran QB. We noted on Sunday evening’s recap how well Manning was stepping into the pocket, buying an extra precious second or two to find his receiver downfield. Veteran QBs like Marino, Elway, Brady and Peyton Manning have always been artful at sensing the rush and getting rid of the ball. There is NO DOUBT that Eli has gotten better this season at sensing the pass rush. So to ignore this and give all the credit to the OL is an error. But nonetheless, the OL is certainly getting the job done. When you consider that David Diehl had 13.5 sacks allowed by himself in 16 games last year, he has obviously made tremendous improvement. He deserves to be singled out, especially after this blog’s criticism of him last year. The Giants scheme to give Diehl help (especially against the faster edge rushers), but clearly he is getting it done. Another perspective on the performance of the OL is penalties. Anecdotally (in the absence of granular OL statistics) the amount of holding penalties we have seen from the offensive line has been pretty low too. Certainly the number of Petitbrown false starts is way down last year and this year. Summary: the OL is doing it in the run game (#1), sacks allowed (#6), penalties. The only thing we could do better is see them in more of the time at the end WINNING the game for the team. When the play calling (ie 4:02 left in Q4 of AZ game) is varied, they can do that ably. ps please email or comment if you are able to supply us with a site that has individual (not team) penalty statistics and/or individual sacks allowed statistics. You are currently browsing the Andygmen's Blog blog archives for November, 2008.